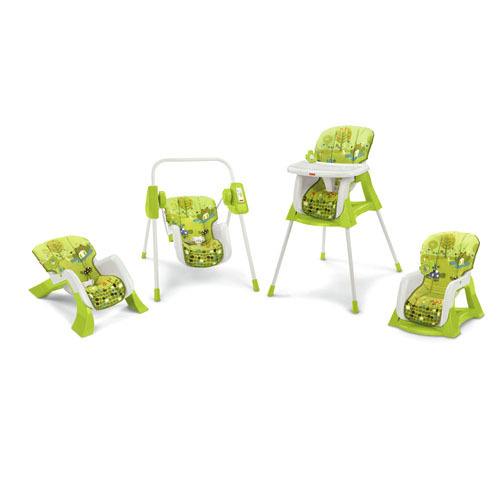 Fit Fluential Mom: The Fisher Price Easy Bundle: An Infant Seat, Swing, Toddler Seat & High Chair in ONE! The Fisher Price Easy Bundle: An Infant Seat, Swing, Toddler Seat & High Chair in ONE! The Fisher-Price EZ Bundle 4-in-1 Baby System is a new, innovative product for moms, dads and babies alike! The EZ Bundle offers four functional items in one convenient, space saving product. For approximately $150, the price you'd pay for just a high chair, you get an infant seat, infant swing, high chair & toddler chair. Utilizing Fisher Price's Snap Fit Technology, the EZ Bundle is a well-designed system that grows along with your child and is practical in every sense of the word. With the amount of items parents buy for a new baby, the EZ Bundle is ideal for saving space around an already crowded home. It provides baby with everything he or she will need from birth through the toddler years. The universal seat easily snaps into the four different platforms. From busy stay at home moms to grandparents and even day care centers, the EZ Bundle offers parents a product that will cover many of baby's needs in one simple product. The infant seat is ideal for newborns up to six months of age. It can be used alone or as part of the infant swing, which features six different speeds. It also has a 3 point restraint system to keep baby safe and in place while feeding or napping. Most stand alone swings on the market today only offer 1-3 speeds. When baby is about six months old and is sitting up straight eating solid foods, the seat snaps into the high chair for easy feeding. The high chair also offers a 5 point restraint system. When baby is done eating and is ready to relax, snap the seat into the toddler seat frame. Not only will it make more space in the kitchen, where most high chairs remain until baby grows out of it, but it gives baby his own place to sit and read, watch educational television or just hang out with mom and dad. The seat itself is suitable for infants and toddlers up to 50 pounds so it can essentially be used far into your child's adolescence. It's made our of a comfortable, stain resistant, breathable fabric that is removable and machine washable. Most seats and high chairs on the market today are only able to be wiped down with a damp cloth. This feature will make the seat not only last longer, definitely for more than one child in the family, but it also keep it looking good for a longer period of time. Reviews of the EX Bundle are great as well. Many say they'd definitely recommend it to friends and family. Most have also purchased it to keep at grandma's house since it's a great four-in-one product. When baby goes to grandma's for a visit, he or she will have everything they need there without mom having to load up the car and lug four different items over. The seat is easy to switch back and forth, making it a user friendly product for busy moms of multiple children. Most moms have said it's easy to assemble, fits anywhere, offers sturdy construction and has a smooth, soothing rocking motion for baby. It's the ideal product for a small apartment, for traveling or simply for a family that wants to save time, space and money all at once!